Upon walking up to the shop, you’ll see both the familiar and the new. Starbucks coffee bean bags have joined the standard window display now, and Starbucks signage is prominent outside of the bakery. 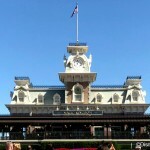 But this newly refurbished facade still indicates the turn-of-the-century charm that we expect to see on Main Street USA. Inside the bakery, you’ll find that the dark woods and Victorian decor continues — reminiscent of the former incarnation of Main Street Bakery. 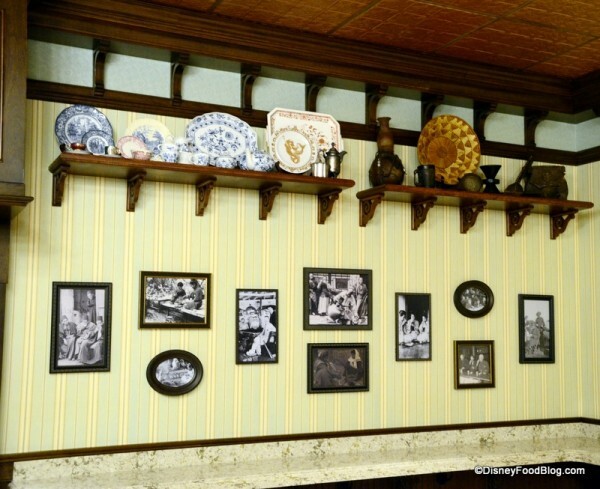 Cast members are still clad in Victorian costume, and chandeliers remain turn-of-the-century true. Of course, there have been some changes. Example #1: the dishware has gotten a makeover! And the set-up has changed to offer better flow for a typical coffee shop…minus the indoor seating. The menu features Starbucks coffees and drinks…note the Disney Dining Plan snack credit options! 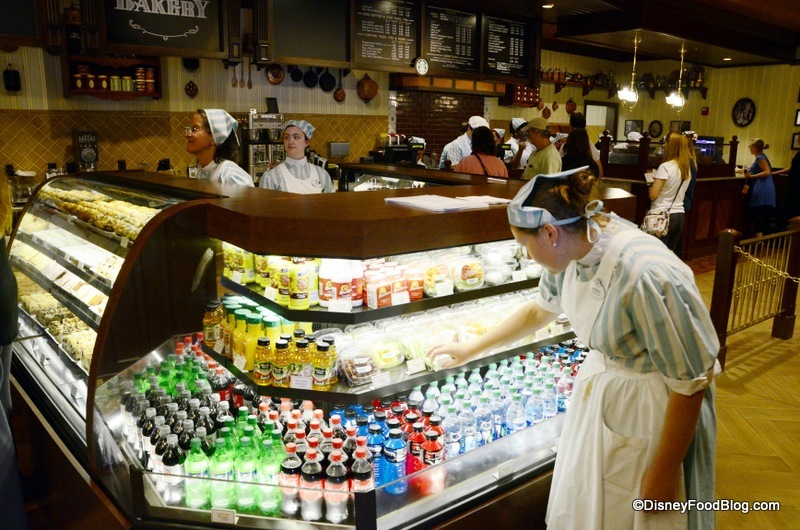 When you get to the front of the line and are ready to make your selections, Cast Members dressed in Victorian costumes are ready and willing to take your order. 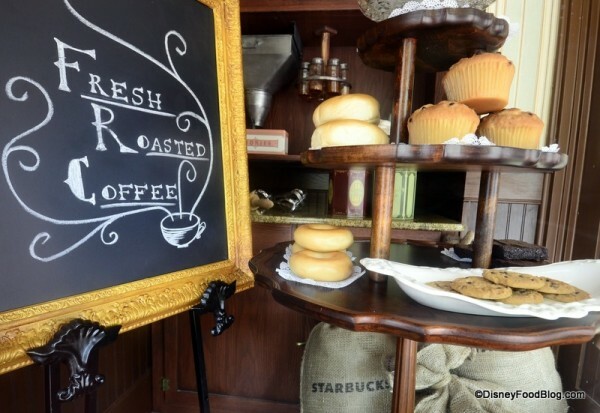 Baked goods here are now primarily Starbucks “brand,” but you will find a few Disney-made options, too. Once you choose your eats and coffee, you’ll have the option to pick up some fresh fruit, grab-and-go items, or drinks from a refrigerated section. Since the cinnamon rolls were not available, we chose another favorite classic Main Street Bakery treat — the Chocolate Peanut Butter Cup Cupcake! Since seating is all outdoors now (and there’s not too much of it to go around, so plan accordingly), we took a seat outside to watch the goings-on of Main Street. The cupcake hit the spot and we’re hoping it will continue to stick around! 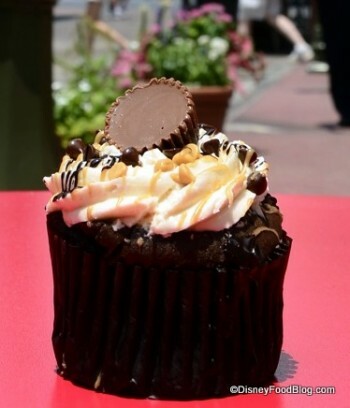 It really is one of my favorite Main Street Bakery treats! I’m eagerly awaiting the official opening of the Bakery on June 18th! I’m sure there will be some changes in the first few weeks and months, so please drop us a line with your perceptions and experiences! 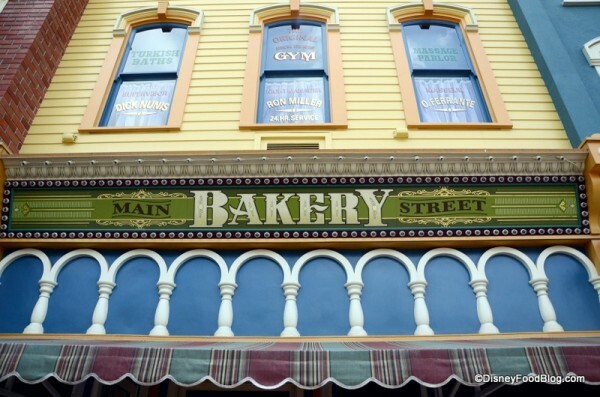 Will you frequent Main Street Bakery for coffee on your way to grab fastpasses? Let us know in the comments below! Thanks Dave Manning for photos! FIRST LOOK! Main Street Bakery Starbucks Offers Soft Opening! This is one of the worst decisions ever by Disney. It was a feature of so many people’s vacations; sitting watching the crowds go by while enjoying fresh baked tempting goodies (and if you had the specials) very nice coffee. Now its nothing but a Starbucks outlet (and even high street Starbucks have seats and tables). I am not exaggerating or overreacting but this may actually influence whether we continue to have two weeks every year in future. I think we’ll be cutting down. 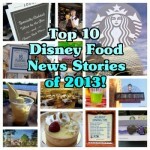 I would like to know the reasoning behind the decision to remove seating from both the Starbucks at the MK and EPCOT. Is is especially troubling for me at the Fountain View at EPCOT where we enjoyed watching and listening to the music while enjoying the food/desserts/ice cream. 🙁 After all, there has always been seating at Starbucks except for perhaps their kiosk locations. Oh my – where to begin! Seating is definitely an important issue for true coffee aficionados (including me), and to make things worse, Starbucks food has a very poor reputation (certainly far below WDW standards). Add to this the fact people either love or hate SB coffee (an acquired taste for many) I think we have a losing proposition. I’ve crossed MS Bakery off my stops during my next visit to the MK. 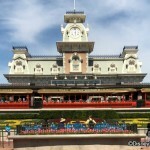 Very sad as there is no imagineering even though it replaced an icon. My local Starbucks are much more themed-but Starbucks is Starbucks and has a commercial look. 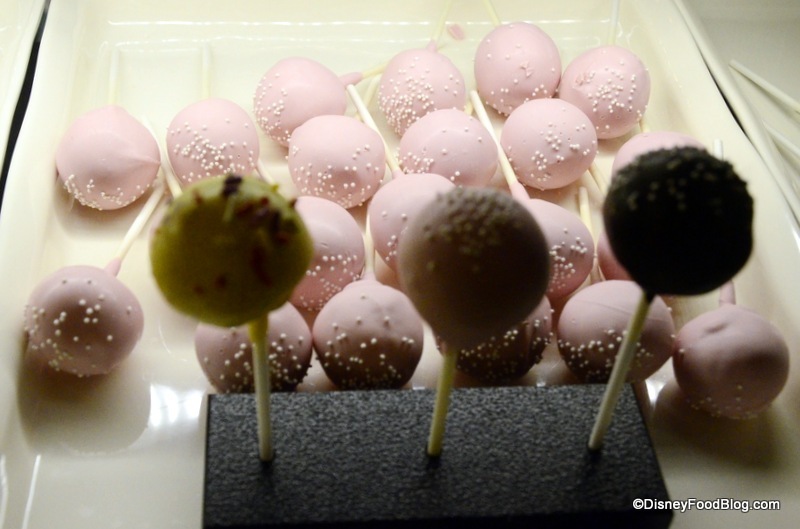 Starbucks baked goods are not good and the food is below Disney quality. All I did when I was there is take a picture to show how plain and un-imaginative it is. No charm, no goodies that I want even though I love coffee. I can get that at home. Having been there, it is less imaginative than my local Starbucks. There is no Disney magic in the atmosphere and it is hard to believe this passed the Disney standards to replace a beloved Main Street institution. This is the best move that they ever made. I was there December of 2011 and couldn’t find a decent cup of coffee anywhere. Now I’m psyched for some quality java while I’m there. Thanks! I think this is fantastic! I’m very happy Starbucks is finally at Disney World! Can’t wait to get there next month!! I’ve been there a few times now and if you care about coffee but not imagineering then it is the place to be. 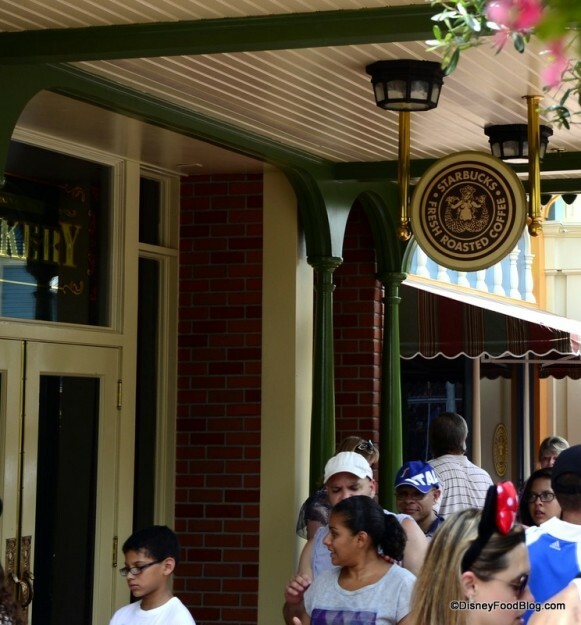 I understand wanting good coffee too but would have thought whoever took it over would have been required by Disney to maintain the Main Street charm. It is much less charming than the Starbucks in my own neighborhood. 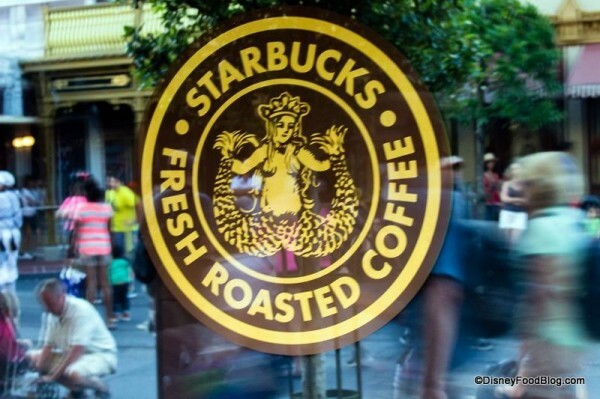 The Disney charm is lost in the Starbucks on Main Street USA. Huge mistake by Disney corporate wannabes! All the baked goods that lured you in are gone. When I’m in there which was only once and my last time, I felt like I was in any Starbucks in any huge city……Disney failed this time! Have now been and seen the damage in person (November ’13) . Its a good deal no doubt – a large cup of specialist coffee for one Dining Plan snack credit. BUT, where is the charm, where are the tempting freshly baked pastries and, most important, where are the seats! We have a Starbucks not 1/2 a mile from where I live. Why would I want to travel 5000 miles to go to one which is more soulless than the one down the road? Disney could have done this AND kept charm, good food and seating but unfortunately, more and more, Disney is just run by accountants. Maximise income at all costs. Trouble is its all short termism and sooner or later the bubble will burst. An institution has been removed. Why were the cinnamon rolls not available? Are they no longer served there? Lynne — The cinnamon rolls are now served at Gaston’s Tavern in New Fantasyland. 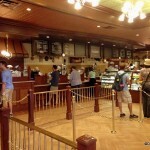 We are at WDW now-I can’t begin to say how disappointed we are that The Main Street Bakery has been turned in to a Starbucks.. 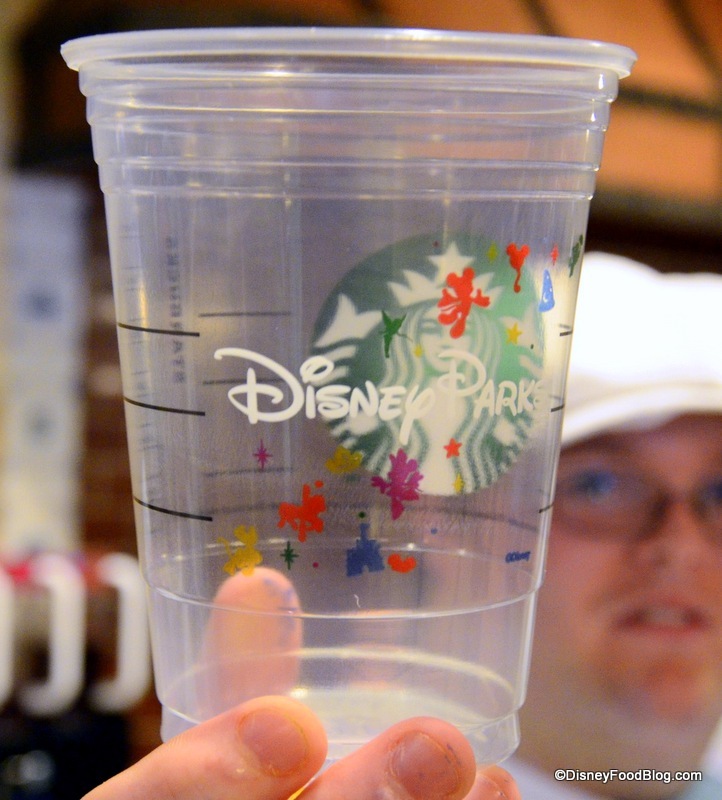 I agree witH some other folks they could have put the Starbucks anywhere in Disney. But to remove a Disney icon is just wrong.. I am so disappointed! I’m suspicious of any large chain moving into a DW park, but I truly thought that Disney would make it worth the compromise by imagineering the heck out of Starbucks. I was expecting more than just Disney-themed cups. I actually thought that this location wouldn’t even be recognizable as a “Starbucks.” I was hoping for Disney-themed drinks, real MS Bakery food, strategic ambient noise…basically, a Disney experience. Way to cheap out, Disney. And really – no tables or chairs? If they wanted a Starbucks with 0 seating, why couldn’t they have left MS Bakery alone and put the Starbucks in a kiosk somewhere outside? Ah, well. At least now we have a place to ditch that annoying family member who hates Disney and needs a ‘break’ from all the magic! I was very excited when I read about the renovation. What could be better than a Starbucks + Main Street Bakery (our go to place EVERY time we hit MK, before starting our day). We even turned our friends on to this place. Grab a nosh, grab a seat and get your morning started right. Boy was I wrong – beloved bakery gone completely in favor of one of the 10,000 sbux in the nation… And not a seat in the place. Someone got big bag of cash for this deal – plus the two new ones at DD. Why not just trade out the Emporium for a Wal-mart? This move to destroy the Main Street Bakery is an epic fail. a place where my parents used to take seat while eating something from the bakery, that was a reason for them going into an amusement park, very bad decision by disney !!! This is so terribly disappointing. Disney has made this decision thinking on their pockets only and not taking into consideration their guests opinions. The corner bakery would always be our first stop on all our Disney family trips, now we’ll be skipping this stop for sure. What’s the next move? Selling out the Crystal Palace to McDonalds? If Walt were alive he would have never allowed this, specially with such an iconic place in the Main Street. Plus, can’t seem to understand what benefit Disney can receive from this partnership, if anything the other way around? 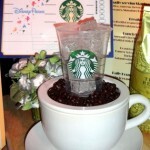 Does Disney REALLY need a partnership with Starbucks? Bleah… Bad move. Walt actually made it clear what his vision for the park was. I don’t think Starbucks fits in with his turn-of-the-century home town Main Street idea that was based on what he fondly remembered from his childhood. I’m pretty sure there wasn’t a Starbuck’s in his vision. Just because people are in there getting a coffee fix doesn’t mean it’s a good idea or in line with good imagineering for the park. It is supposed to be a small town bakery not a coffee chain that you can go to ANYWHERE. They should have kept it as is, with the specialty baked goods they had before. Just switch out the coffee. No branding on the main sign, just a Stabucks sold here on an old timey sign in the window… and yes, they did have caffiene there before Starbucks! And seating! And charm! And respect for established imagineering smarts! For all you people who knew Walt so well, I guess you missed that almost every spot in disneyland had a corporate sponser when they opened. FYI they had McDonalds french Fries all over the parks and got rid of them about 6 years back. We miss those giant fries they were a great snack that we could all share. Its OK that YOU just don’t like it. Me on the other hand love it and I go everyday while I am there. If I am in the MK I grab my coffee walk to Gastons and get my cinnamon roll and am 1 Happy Camper!!! They didn’t have McD’s signs pasted all over Casey’s Corner’s. I don’t like it either. Oh the coffee was much needed but there is no place to sit and that’s a real shame. I wish I could get my coffee and then after waiting in that line for ages walk all the way back to Gaston’s for a Cinnamon roll but I’m usually in a bit of pain by then. Besides for me it wasn’t about the pastries but more about sitting and enjoying my coffee and what not inside the Bakery on Main Street. I don’t know why they didn’t open up some space behind their Starbucks and create a seating area, but they like us to keep moving it seems. The plus is reasonably decent coffee at last and if you are on the dining plan, a free (effectively) GIANT cup of coffee that’s enough for two. But I’m afraid to say, this is completely outweighed by the fact that you can’t get anything freshly baked to eat , you can’t sit down and the place has as much ambiance as …well… a high street Starbucks”! Whether Walt would have approved or not is irrelevant. He’s not here and nobody knows what he would have thought. What matters is the visitors and all the comments on all the forums seem overwhelmingly anti- Starbucks (10-1 I’d guess??). But as many have said Disney Corp don’t give a damn what visitors think, only how much money they are raking in from franchises. 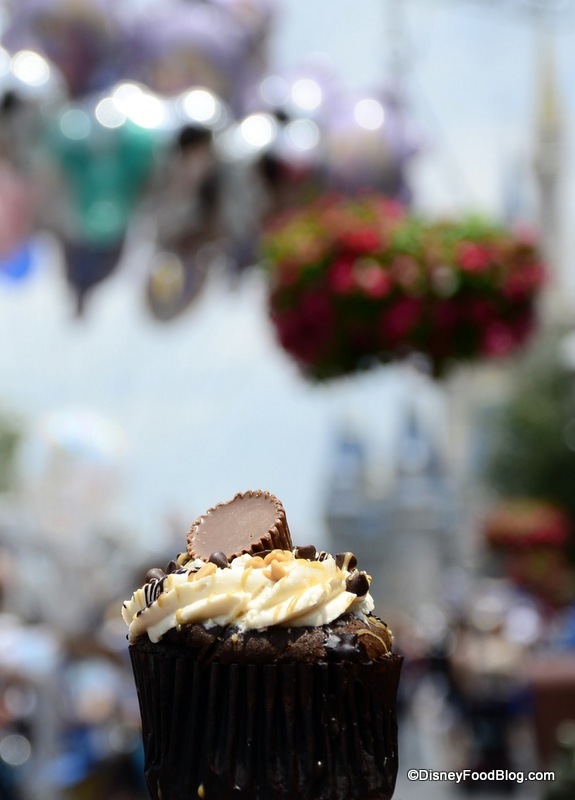 In ten years of two week vacations (almost 6 months stay in total) I have never been asked my opinion of the parks, attractions or food outlets by Disney polsters. I have been surveyed countless times but only to find out where we come from, are we in a Disney resort and how long we are staying. ie are they marketing the product successfully to the right people. The magic gets a little less each year as the accountants gradually take control and MSB is an good example. The bakery was traditionally our breakfast stop everytime we went to MK. 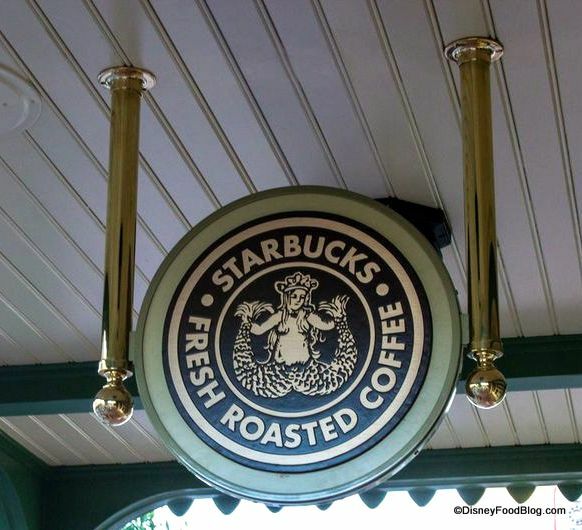 If they wanted to add a Starbucks to the park why not put it on a kiosk somewhere? I loved the baked goods and sitting in the bakery eating breakfast. If wasn’t about the coffee for me. On my last trip I went to the MSB Starbucks about 3 times. It’s not the same, they sell baked goods but it’s not the same. They sell stuff you can buy at Big Top treats. I preferred the original MSB. If I remember correctly a drink will cost 2 snack points on the DDP. My beloved Apple turnovers were a casualty of the changeover. A family favorite gone forever. Simply tragic. Disney ruined the magic. Every year for 20 years we went into the bakery to get a warm cookie ice cream sandwich and then sit opposite the bakery and wait for the parade to come by. A tradition. Ruined by commercialism. I didn’t think Disney would take the magic and wonder of Main Street and ruin the experience by Replacing a beloved landmark with Starbucks!! Of all things. Starbucks is NOT a coffee everyone likes. Obviously this was a money decision. So disappointing. In addition we are presented with tgeur VERY LACKLUSTER food items. Mundane and tasteless at best. NOT what we have experienced in the past years on Main Street. The cinnamon rolls? Really? Items that were looked forward to on return trips. SHAME on Disney for compromising the integrity of the Disney Experience. I’m thinking this might change how we view the magic that makes Disney the happiest place on earth. 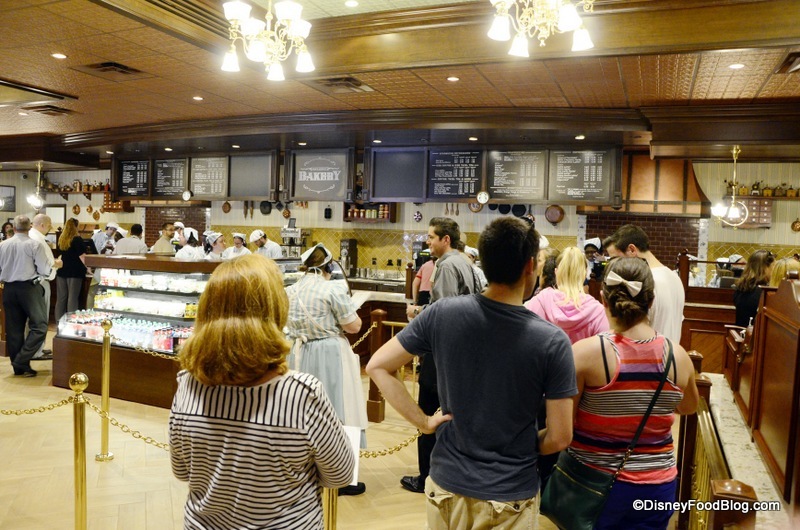 I also agree this was a complete shock to our family that the Main Street Bakery is now gone. We use to stop there before we were getting ready to leave the park as our family tradition. We would sit and eat the wonderful desserts and talk and listen to the parade go by. It was magical. It is truly a major dis-appointment to our family . Starbucks could be anywhere. Why get rid of the Disney Icon that made Main Street what it is. 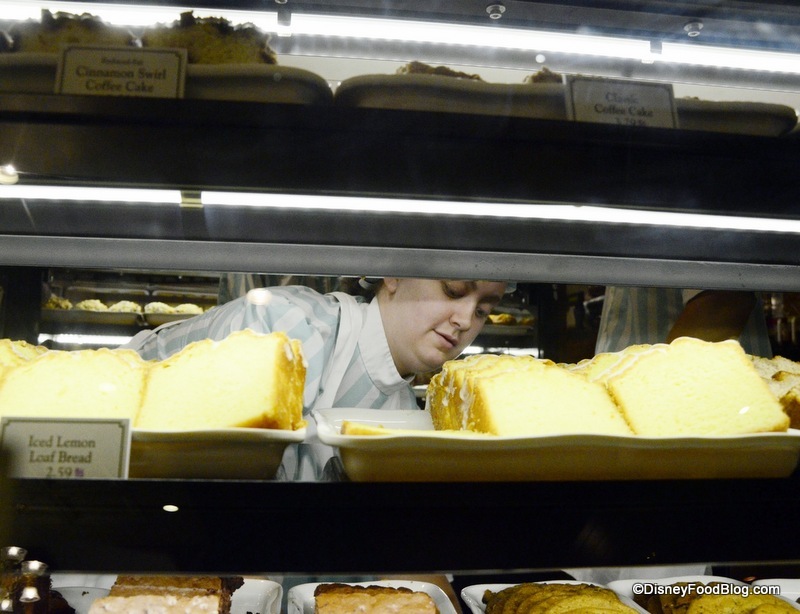 We are so very upset about this decision and have hope that Disney will bring the Bakery back. Here’s holding out HOPE. Don’t hold your breath Karla. As stated many times in this thread, Disney is now managed by money-grabbing accountants who don’t care a jot about Disney magic, only by how much money is rolling in from franchises. Its a very dangerous game to play though. All of a sudden they will find that the “magic”, the one thing that keeps people coming back and staying for weeks (which they certainly don’t do at other parks) will have been thrown away. People will vote with their feet. Main Street is symptomatic of that change. We have been regular visitors since the eighties. When we first came it really was lots of little shops selling different merchandise. Now its essentially a huge department store masquerading as little shops and a Starbucks masquerading as a bakery! Well, first off, I must say I’m as disappointed as many (the overwhelming majority) of you. The old Main Street Bakery was once a much looked forward to breakfast spot for my wife and I after a few days of eating cold breakfasts in our motel room. If we darken the door of the place in the future, it might just be for an afternoon pick-me-up out of necessity (and lack of other choices nearby). 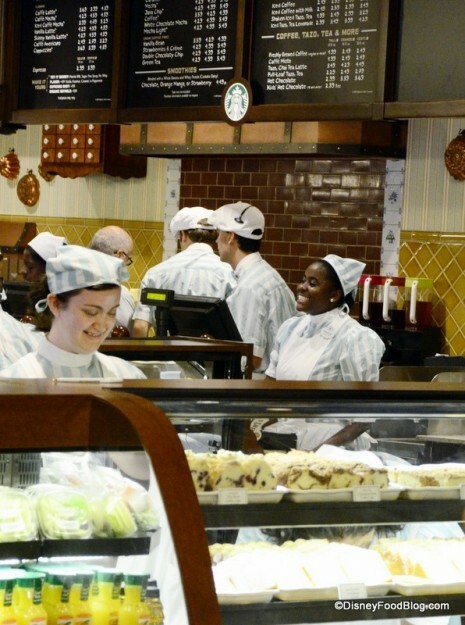 After all this time im still disappointed at the change from the bakery to a Starbucks. We do so miss the wonderful sandwiches the bakery served. They were delicious!